QEHB’s Centre for Rare Diseases has this week become part of the NIHR (National Institute for Health Research) BioResource network. 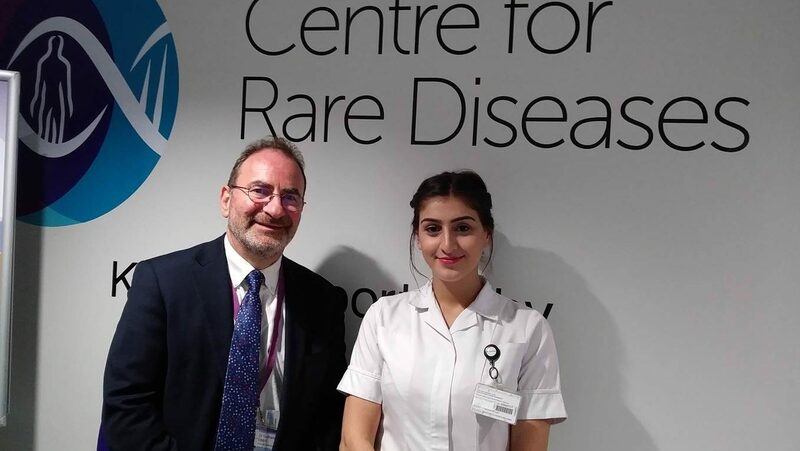 The BioResource team at will be led by Dr Graham Lipkin and Humeira Hafsa, research nurse, will take on the role of Clinical Trials Coordinator. The NIHR BioResource for Translational Research in Common and Rare Diseases is a national resource of samples collected from patients and members of the public who have volunteered to be recalled for research, based on their genotype and phenotype. When patients are recruited, Humeira will collect a range of blood samples and add them to the national ‘biobank’ for future use in research. Being involved in biobanking is obviously optional – patients can opt in and out as it suits their lives and condition. Possible candidates will be identified by Humeira and then approached to become involved and given further information when they come in for an appointment with their own consultant. If interested they will then meet with Humeira who will talk more about the system before signing them up and taking samples. The NIHR BioResource provides researchers with unprecedented access to highly characterised patients with common and rare diseases, as well as volunteers from the general population. Patients and the public can volunteer to provide a DNA sample and information about their health, lifestyle and family history. Following genomic and phenotypic characterisation, specific individuals can be recalled, on a national basis, to participate in both academic and industry-led early translational (experimental medicine) research studies. Humeira has been a research nursing assistant for two years, previously assisting in various trials. Before moving across to research she worked as a Health Care Assistant on the wards and started off as an apprentice in business and administration at UHB. The NIHR BioResource has been established through a partnership with NHS Blood and Transplant, and builds on the expertise of NIHR Biomedical Research Centres and NIHR Clinical Research Facilities. Over 100,000 people have already been recruited to the NIHR BioResource and up to 50,000 new participants will be recruited each year. The NIHR BioResource is also increasing the number of study participants available through recruitment of people with selected conditions, such as inflammatory bowel disease, fatty liver disease and up to 100 rare diseases. The NIHR BioResource uses information on people’s genotype, phenotype or both, to match them to research studies that are looking for volunteers with and without health conditions. By joining, you will be helping researchers investigate and understand why some people have a disease. If you would like to join the NIHR BioResource, email: nbr@bioresource.nihr.ac.uk.